This recipe is not that spicy. If you want more heat, add more cayenne. This recipe is taken from Food and Wine Magazine’s Quick From Scratch Chicken Cookbook. 1. In a large pot, heat the cooking oil over moderately low heat. Add the onion and cook, stirring occasionally, until it is translucent, about 5 minutes. Add the garlic, coriander, ginger, black pepper and cayenne; cook, stirring, for 30 seconds. 2. Add the broth, coconut milk, fish sauce, salt, and lime zest. Bring to a simmer, stirring occasionally. Reduce the heat and simmer, partially covered, for 10 minutes. 3. Meanwhile, in a large pot of boiling, salted water, cook the fettuccine until just done, about 12 minutes. Drain. 4. Add the chicken to the soup and simmer until just done, about 1 1/2 minutes. 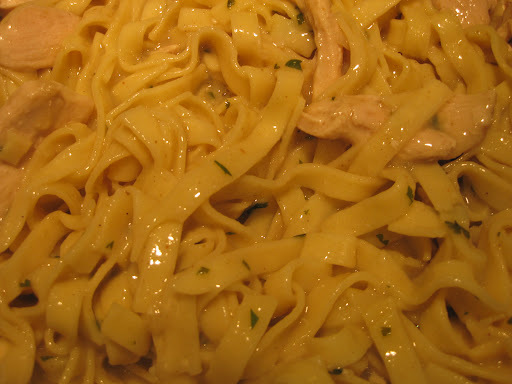 Remove the pot from the heat and stirring the fettuccine, lime juice, and cilantro, if using. Serve the soup in bowls with a fork and a spoon. I found this recipe about 2 years ago in the Winnipeg Free Press Recipe Swap section. I love the crispy outside and the soft centre of these cookies. This recipe calls for 1 tsp of salt. I have made these cookies with that amount and I found them too salty. This time I only used 1/4 tsp and the cookies turned out better. 1. Preheat oven to 375F with rack in middle position. 2. Melt butter. In large bowl add the melted butter and sugars and stir. Add soda, salt, vanilla, and beaten eggs. Mix well. Stir in flour gradually. Add crushed corn flakes and chocolate chips and mix throughly. 3. Form dough into walnut-sized balls and place on greased cookie sheet. Press them down slightly with a floured or greased spatula. (I just used my hand). Bake for 8-10 minutes. Cool on cookie sheet for 2 minutes then remove to a wire rack until completely cool. Cooling on the rack is important as it helps them get crispy. 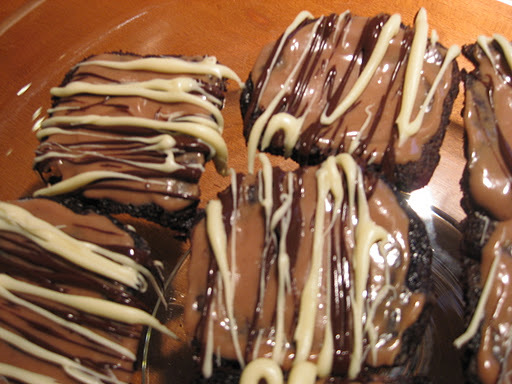 This is one of my favorite brownie recipes. It is taken from The Complete Light Kitchen by Rose Reisman. 1. Preheat the oven to 350F. Spray an 8-inch square pan with cooking oil. 2. For the brownies, combine the sugar, oil, egg and vanilla in a bowl and mix well. Add the cocoa, mixing it in well. 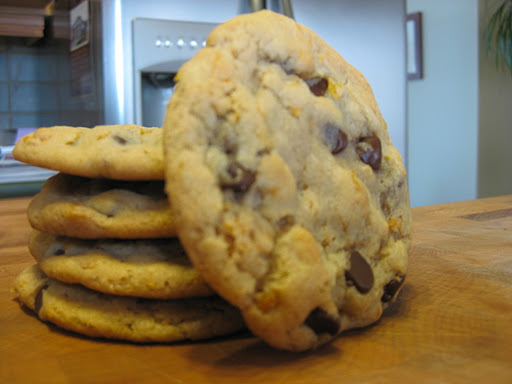 Add the flour, baking powder, yogurt and chocolate chips, mixing just until combined and smooth. Don’t over mix. 3. Pour the batter into the prepared pan. Bake in the center of the oven for 15 to 20 minutes, just until set. Do not overbake. Cool on a rack for 15 minutes before icing. 4. To make icing, place cream cheese, icing sugar, 1 1/2 tsp cocoa powder and water in a blender or food processor and process until smooth. Spread over the top of the brownies. 5. Cut into squares and garnish with a dusting of icing sugar, or drizzle melted dark and white chocolate overtop. I used this as a cold antipasto for my dinner party, but you can use this as a hot sauce on pasta. This recipe is taken from “The Italian Way – Cooking with the Deluca’s”. 1. Seed and chop the tomatoes and set aside. In a skillet, heat the oil over medium-high heat and add the garlic. Sauté for 5-10 seconds, turn up the heat to high, and add the mushrooms, bell peppers, chili flakes, and salt. Cook for 3-4 minutes and add the parsley, basil, oregano, tomatoes, and their juice. Turn the heat down to medium and cook uncovered for 15-20 minutes or until the sauce thickens. Serve hot or cold as an antipasto with slices of Tuscan bread or as a sauce on pasta. Sprinkle with spicy peppercorn cheese before serving. Fantastic!! Another gem taken from “The Italian Way – Cooking with the Deluca’s”. 1. 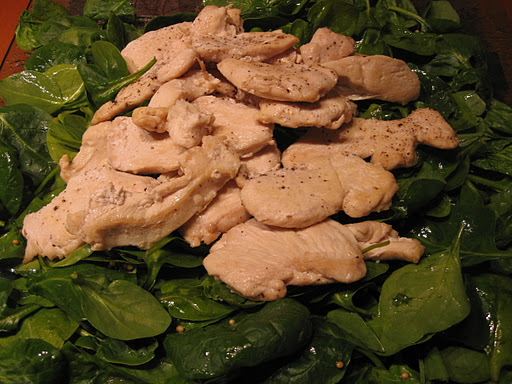 Wash and dry the spinach leaves and arrange on a serving platter to use as a base for the chicken. Refrigerate until ready to use. 2. Peel the shallots, chop coarsely, and place in a large saucepan with the wine. Allow the wine to boil until reduced in half. Remove the shallots, let cool for 5 minutes and transfer them to a blender or food processor. Add the oil, vinegar, salt, pepper, and mustard seeds and blend until dressing is smooth and consistent. Set aside. 3. Place the chicken breasts, one at a time, between sheets of plastic wrap and pound lightly with a mallet or rolling pin to uniform thickness. Slice in 1/2-inch strips. Heat 5 tablespoons of olive oil in a skillet and cook the chicken strips for 3-4 minutes. Add salt and pepper to taste. Transfer the chicken strips to the spinach platter. Top with the dressing and serve. These were a big hit at the dinner party I hosted last night. They are super easy to make. The recipe asks for pecorino cheese (which I found out is a Romano cheese). Pecorino cheese is available at Deluca’s. I used Kraft Parmesan for the 1/2 cup Parmesan and freshly grated Parmesan to replace the 1/4 cup of pecorino with great results. This recipe is taken from “The Italian Way – Cooking with the Deluca’s”. 1. Wash and dry the mushrooms and remove the stems. Using a paring knife, cut away some of the mushroom cap to form a larger cavity. Set aside. 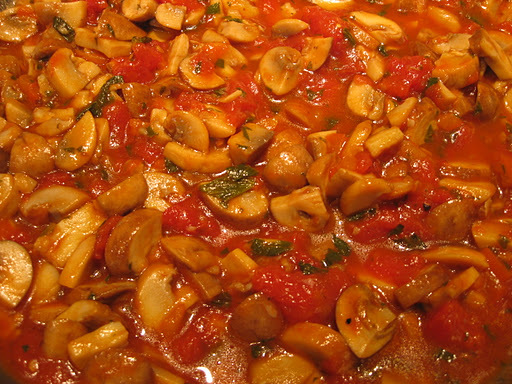 (Mushrooms can be cleaned and refrigerated in an air-tight container for up to two days before use). 2. Melt the butter over low heat in a saucepan and add the oil, garlic, salt, pepper, parsley, oregano, and chili pepper. Let the spices steep in the liquid for 5 minutes. Meanwhile, combine the three cheeses in a small bowl. 3. 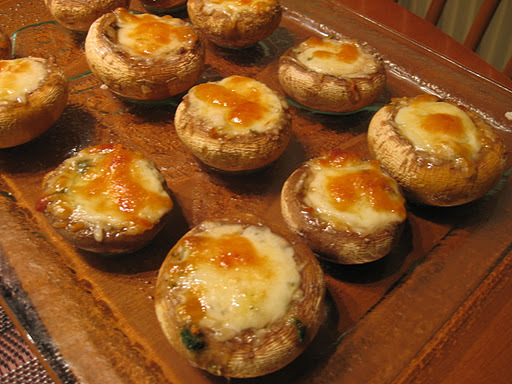 Place the mushroom caps in a baking dish. Spoon the butter and oil mixture evenly into the mushroom caps and fill with the cheese mixture. Broil the mushrooms until cheese is golden, about 8-10 minutes. Serve hot. This recipe was taken from Nigella Lawson. It is so good!! I used 2 small avocados since I couldn’t find a regular sized one that was ripe. The pumpernickel is perfect with this although I could not find the small cocktail pumpernickel rounds asked for in the recipe. I just bought sliced pumpernickel rye bread, toasted it and cut it into squares. 1. Spoon out the flesh of the avocado into a food processor, and add the lime juice and crushed garlic. 2. Add the salt and drained peas and then process until you have a Kermit-coloured puree. 3. 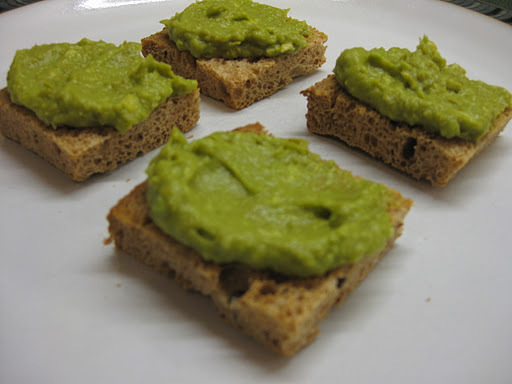 Spread the pumpernickel rounds softly with the avocado and pea mixture and arrange on a large platter for serving. I love these muffins! Perfect for a quick breakfast too. This recipe is taken from Norene’s Healthy Kitchen by Norene Gilletz. 1. Preheat the oven to 375F. 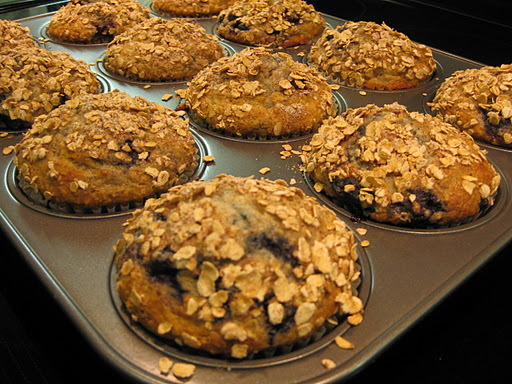 Line the compartments of a muffin pan with paper liners (or spray with cooking spray). 2. Combine the topping ingredients in a small bowl, mix well, and set aside. 3. In a large bowl, combine the milk with oats. Let stand for 3 to 4 minutes or until the oats have softened. 4. In a food processor fitted with the steel blade, process the eggs, oil, and sugar for 2 minutes or until light in color. Add the bananas and process with several quick on/off pulses, until coarsely mashed but not puréed. Transfer the banana mixture to the milk-oat mixture and stir to combine. Add the flours, baking powder, baking soda, and salt to the bowl; mix just until combined. Using a rubber spatula, carefully fold in the blueberries. 5. Scoop the batter into the prepared muffin pan, filling each compartment about two-thirds full; sprinkle with the reserved topping. Bake for 25 minutes or until golden brown. When done, a cake tester or toothpick inserted into the center will come out clean. Although, this recipe is really good, there is room to add a little more spice. I used ground chicken since I couldn’t find ground turkey. I also used red pepper instead of green. 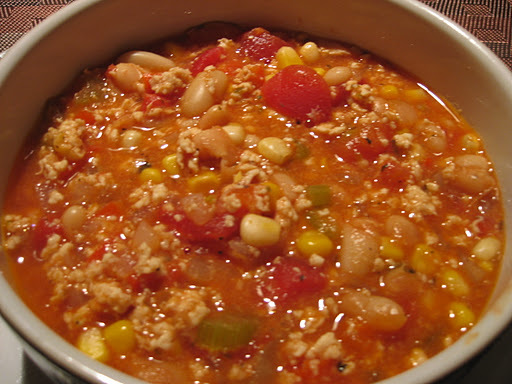 This recipe is taken from The $10.00 Gourmet by Ken Kostick. 1. Heat the olive oil in a medium-sized pot. Sauté the ground turkey until cooked. 2. Add the onion, celery, and green pepper, and sauté for 4-5 minutes, or until the vegetables are translucent. 3. Add all the remaining ingredients and simmer on low for 15 minutes. Add more stock if it’s too thick.